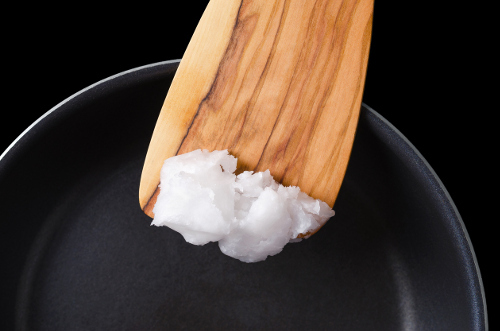 If you’re using coconut oil as your daily fat source for cooking or adding flavor to some of your favorite dishes, I have some disheartening news for you…It’s likely doing far more harm than you’d like to think. I know this can be hard to believe. Ever since it became highly popularized five or six years ago, coconut oil has been viewed as a health food by many. A quick Google search indicates it’s a healthy alternative to other fat sources, and can help prevent Alzheimer’s and heart disease and even contribute to your physique goals. But, as is often the case with foods that receive celebrity endorsements and otherworldly hype, there isn’t much science that stands firmly behind it. A brand-new report from the American Heart Association shows that coconut oil offers no favorable health benefits, and at the same time, increases risk factors for cardiovascular disease. So if that’s the case, why does research show that 72% of Americans think coconut oil is healthy? There is evidence suggesting that limiting saturated fats in the diet can cut cardiovascular disease risk by 17%. Essentially leading to the conclusion that the less coconut oil you eat, the healthier you’ll be. The reason why coconut oil has such a good rep is because of its genetic structure. Unlike its saturated-fat counterparts, it’s a medium-chain triglyceride (MCT). It may be metabolized by the body differently, leading to less overall stored fat. However, older research that indicated it could contribute to speedy fat metabolism used nearly pure MCT—something that is not found in natural coconut oil or the products available on store shelves. So, in terms of real world applications, the study’s results are virtually voided. Now, does this mean you should throw away your coconut oil and shun it like a “Big Mac” combo? No, it doesn’t. Just don’t believe it offers health benefits or that it’s a safer alternative to butter or other saturated fats. You can still feel safe when using it occasionally to cook. After all, it does make some dishes taste much better. But try to incorporate it less into your daily/weekly routine. Instead, opt for vegetable oils like olive oil and canola. And, get a wide variety of healthy fats from sources like avocado, nuts, legumes, and nut butters. Sacks, F., et al., “Dietary Fats and Cardiovascular Disease: A Presidential Advisory From the American Heart Association,” Circulation. June 15, 2017. DOI: https://doi.org/10.1161/CIR.0000000000000510, last accessed June 27, 2017. May, A., “Coconut oil isn’t healthy. It’s never been healthy,” USA Today, June 16, 2017; https://www.usatoday.com/story/news/nation-now/2017/06/16/coconut-oil-isnt-healthy-its-never-been-healthy/402719001/, last accessed June 26, 2017. “Coconut oil health claims not all they’re cracked up to be, says report,” CBC News, June 20, 2017; http://www.cbc.ca/news/canada/calgary/coconut-oil-study-health-heart-disease-saturated-fats-1.4169540, last accessed June 26, 2017.